Doctor Pen made of ABS plastic click-action ballpoint pen with doctor clip. This promotional pen is just what the doctor ordered!Made of ABS plastic, this 5 3/4" click action ballpoint pen features an adorable doctor clip. It comes with medium black ink. 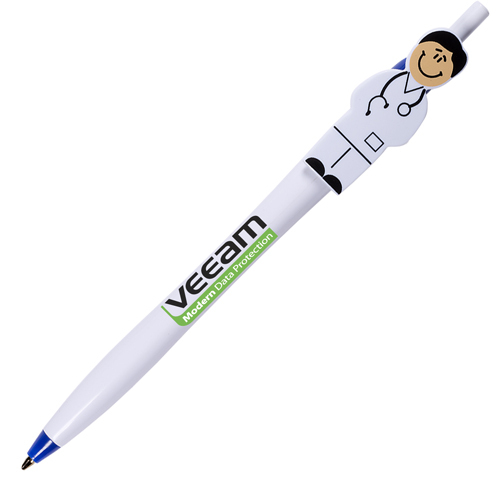 Ideal for pediatricians, medical students, doctors' offices and more, customize this exclusive pen with an imprint of your company name and logo for maximum brand exposure. Feature this doctor pen at your upcoming health and wellness campaign! Bulk / 28 lbs / 1500 pcs. / 10x16x14box.